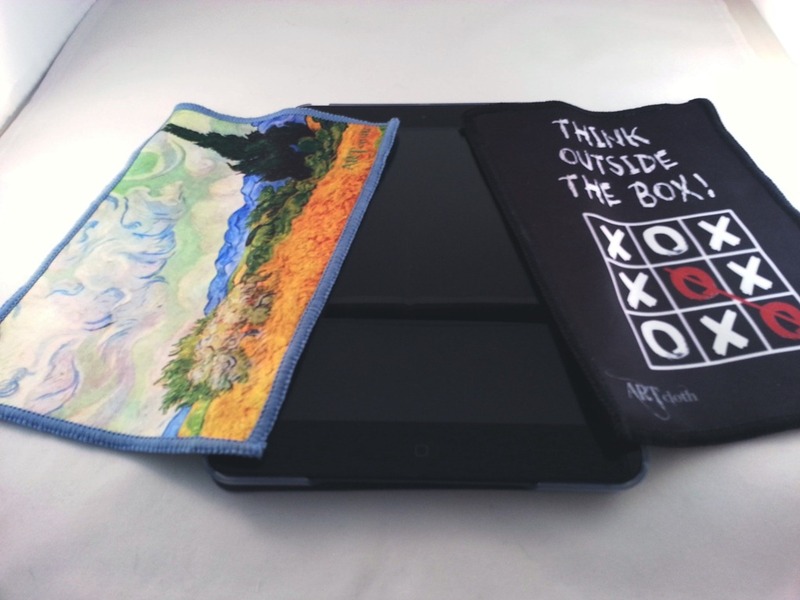 ARTcloth is a line of cleaning cloths for the iPad that brings some artistic flair to the decidedly unglamorous task of cleaning your iPad touchscreen. As many of you know, I’ve become a big fan of cleaning cloths for the iPad and my other touchscreen devices. They’re all terrible smudge (and germ) magnets and a good cleaning cloth is an unheralded but essential accessory for them. I’m not against having a cleaning cloth that looks nice, as long as I still does its job well – and I’ve been trying out ARTcloth with all my devices for quite a while now. So now I’m ready to share a few notes and thoughts about them. The ARTcloth is made of 100% ‘deluxe’ microfiber. I really couldn’t tell you what the difference between just microfiber and deluxe microfiber is, but it sounds good. These are anti-bacterial and ‘dual-textured’ – with a soft side used to clean and a smooth side used for polishing and buffing after cleaning. They should work well with any touchscreen devices. The ARTcloth is sized at just over 5X7 inches, not that much smaller than the overall display area of the iPad mini. They’re machine washable – so you can keep your cleaning accessory itself clean. They come in a wide range of attractive designs. Categories for these include Masterpiece Gallery, Vintage Flair, Graffiti Line, and Contemporary. As you can see in the photo at the top of this post, my two sample units are one from the Masterpiece Gallery and one from the newer Graffiti Line Both look good and my 10 year old daughter is now using the masterpiece one. More importantly, these don’t just look pretty – they work quite well too. They get all our screens clean and are easy to use. They’re not quite as fast and effective as my favorite Mobile Cloth, but they’re close. Overall, I’m impressed with ARTcloth. They’re an accessory that my daughter and I will be keeping around to help with keeping all our iOS and other touchscreen devices clean. ARTcloth has a standard price of $9.95, though they are currently running a sale with many of the designs discounted to $7.95. You can also find them on Amazon at around $8-10. For more details or to place an order check out the ARTcloth product page. Disclosure: The post author was provided with sample units for this review. For information on our review policies please see our About page.